I talk with Tim Ewing of Grand River Ramblers about collaborative song writing, surprising successes and where the band finds inspiration. 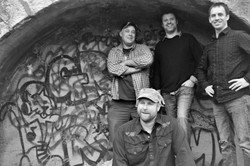 For more information on Grand River Ramblers, please visit their website here. This profile of Tim Ewing is based on a telephone interview conducted and recorded on August 22,2016.